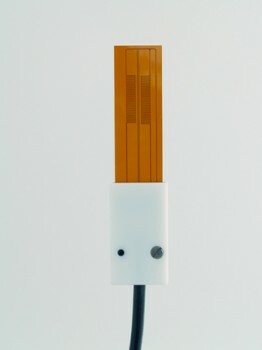 The TP01 is a sensor for the long-term monitoring of soil thermal conductivity, thermal diffusivity and heat capacity. TP01 is designed for long term (permanent) installation in soils. It covers the the thermal conductivity (λ) range of 0.3 to 4 W/m.K, which is sufficient for most anorganic soil types. The core of TP01 is a differential temperature sensor (2 thermopiles) measuring the radial differential temperature with record breaking sensitivity. The sensor performs a temperature measurement around a heating wire. Both heating wire and sensor are incorporated in a very thin plastic foil. The low thermal mass makes it suitable for estimating thermal diffusivity (a). Dividing λ by the thermal diffusivity, a, gives the volumetric heat capacity Cv, which varies with water content. The thermopile signal minus the initial offset (U - U0) when heating with power Q depends on λ and a of the medium. Eλ is a calibration constant, t is time, F is a function that equals 1 for large at. By looking at the steady state signal amplitude λ can be determined. Cv and a can be found by looking at the 63% response time for F. The detection of changes in Cv (and water content) is the strong point of TP01; the resolution is much better than the accuracy. The product manual can be obtained via e-mail. A program for use with the Campbell Scientific CR10X and CR1000 are available. Hukseflux has a broad product range of sensors for thermal conductivity measurement; please consult the product catalogue.